Yesterday, Amy shared her Disney bucket list as a part of the Magical Blogorail. This is a topic the Growing Up Disney family had also been kicking around as a team post idea. So the guys decided to get in on the fun. Below are their Disney bucket lists. Amy's can be found here. 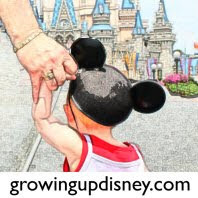 DisneyDad: The thought of a Disney Bucket List is interesting. I’m not the type to make to-do lists. (Item 1 – Make List; Item 2 – Forget where you put the list) Several things on my list are “wishes” rather than things I expect to ever do. I started making my list as I could think of To-Do items then went back and added some that are To-DONE. I could have added some other things that have been done already like: Take my Bride on our honeymoon to WDW (done 1973) or Take my daughter on her first trip to WDW (done 1979). It would take me a while to write down all the special things we have done over the years at WDW. Below are things I’d like to do along with a few that I have already done. Spend the night in the "Castle Suite"
Ridge: Bucket list… usually these are reserved for doing the impossible, improbable, implausible, the questionable, problematic, challenging or just downright wishful things before we die. Of course in this scenario it isn’t my turn to go, but Disney’s time. What if they were to kick the bucket? What are some of the last things we would want to do before the parks, studios, stores, television and all other subsidiaries were to shut down or change hands to someone other than the Walt Disney Company? Take a dinner/fireworks cruise on the Grand One. Take a real cruise on the Magic, Wonder and Dream cruise ships. Stay one last long weekend at OKW. See Walt’s Office at the studios in Burbank. Spend a day at the archives. Spend a day with Bob Gurr. Have 6 & 7 happen at the same time. Have the ultimate fastpass that was good anytime I wanted it and I just walked to the front of the line. Spend a day with Charlie Ridgeway. Take some of the trips with Destinations by Disney. Ride Space Moutian, Rockin' Roller coaster and Expedition Everest with the lights ON. Ride Toy Story Midway Mania as many times as I want. Stay in each of the resorts. Be a Jungle Cruise skipper for a day. Be a Safari driver for a day. Spend the day with Steve Barrett hearing all the stories about hidden Mickeys. What did we miss that's on your list?